Fork dynamics during replication elongation. The INO80 complex is recruited to stalled replication forks to stabilize the replication machinery. INO80 could act on nucleosomes either in front of or behind the fork to preserve replication fork integrity. The overall objective of Manolis Papamichos-Chronakis group is to decipher the interplay between the multiple machineries that keep our genome intact and the chromatin structure of DNA. Using a combination of genetics, cell imaging and high-throughput technologies in budding yeast and human cells they are exploring the role of chromatin remodelling and histone variants in eukaryotic DNA replication, DNA repair and cell division. DNA damage and aberrant chromosome replication can jeopardize genome integrity with devastating effects to an organism’s health and survival. For that reason, several pathways have evolved to cope with damaged DNA and to promote proper duplication of the genome. In eukaryotic cells, the genome is organized in the compacted but highly dynamic chromatin structure and during the DNA damage response or within S phase, specialized chromatin structures are formed. These structures are distinct combinations of chromosomal epigenetic information and the function of chromatin remodeling machineries that contend with the nucleosomal structure of DNA and are suggested to play a vital role in promoting DNA repair and stabilizing replication forks. 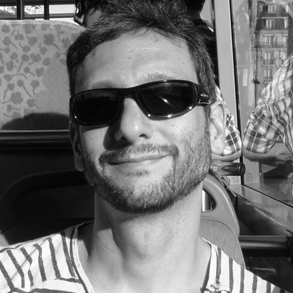 The overall objective of Manolis Papamichos-Chronakis’ group is to understand how fundamental DNA metabolic processes like DNA replication cope with the compacted chromatin structure and to elucidate the chromatin-mediated mechanisms that are essential for the maintenance of genomic stability. 1/ They are exploring the role of chromatin remodeling in eukaryotic DNA replication. Our previous work has established a novel central role for the evolutionary conserved ATP-dependent chromatin remodeling complex INO80 in the progression and stability of the replication forks. However, how INO80 contributes to DNA replication is still unclear. 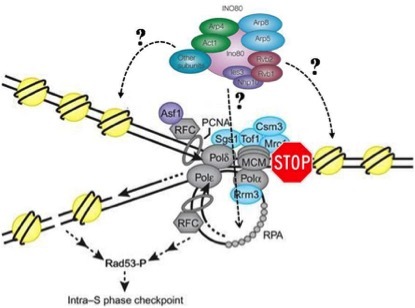 They anticipate that their future studies will help us understand not only the chromatin-mediated mechanisms that promote genomic integrity during S phase but also how eukaryotic replication is accomplished in the obstructive chromatin environment. 2/ They are investigating the mechanisms that control the propagation of specialized chromatin structures during S phase. Correct re-establishment of the epigenetic landscape behind the replication fork is vital for chromosome stability. They have discovered a functional interaction between the INO80 complex and the histone variant H2A.Z that is vital for genome stability in S phase. Understanding how H2A.Z localization is regulated during DNA replication and why proper deposition of H2A.Z during DNA replication promotes the stability of the genome is a major goal of our current studies. Their approach is based on a powerful combination of yeast molecular genetics, biochemistry and high throughput technologies like mononucleosomal tiling microarrays and ChIP-sequencing (Fig. 2A). Manolis Papamichos-Chronakis anticipate that our studies will help dissect the mechanistic underpinnings of genome integrity and ultimately contribute in the fight against cancer.